Undoubtedly, Facebook is the largest Social Media on the planet with millions of regular visitors. Almost everyone in the world uses Facebook to stay connected to other people and to know latest things hepping in the World. Well, Now you guys are searching for How to Delete Facebook Account permanently. 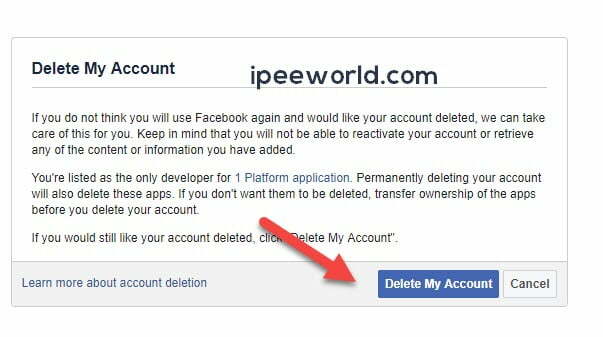 In this article, I will share step by step guide to Permanently Delete Facebook Account. Got your Facebook Account Disabled read this guide. Whatever be the reason, we may want to delete Facebook Account. A lot of people delete their Facebook Account because they get too addicted to it. Scrolling through Facebook without focusing on work and decreasing productivity absolutely makes no sense. These people prefer deleting Facebook account to concentrate back on Work, Now, there are another set people who just wanted to deactivate their account for a few time period. This option is mostly chosen by Students. Because, when Exams are near, they prefer Deactivating their Facebook account and after exams, they Reactivate it again to spend their holidays. If you want to Contact Facebook then follow the steps mentioned in that article to get any help related to your account. I know you are here to know How you can permanently delete Facebook Account that means your primary need is not to deactivate it but to permanently delete it. This is guide will include both Deactivating and Permanent delete methods. So, that if you have changed your mind now, then you can proceed to the method or stick on to the first one. Permanent Delete: This feature will permanently delete your Facebook account from their service. After deleting even if you change your mind, you cannot get your account back, this is what we meant by Permanent deletion. Facebook Deactivation: Deactivation means removing your account just for a limited number of days of your choice. 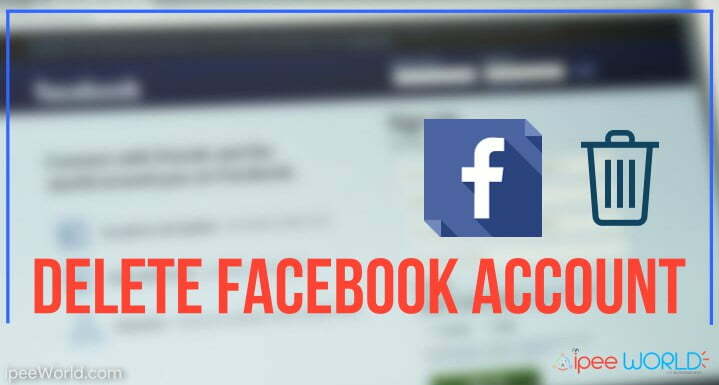 Let’s say that you want to temporarily hide your account from Facebook and after few days you want to get the account back, in this situation you can go with the second option mentioned in this article which will help you to Deactivate Facebook Account. Before we begin I suggest you guys take an entire back up of your existing Facebook account. It will be really helpful if you ever wanted to create a new account with the same information. Now you will see another green button telling Download Archive, hit on it and you are all good to go. Now that we created our Account Backup, let’s get into real work. 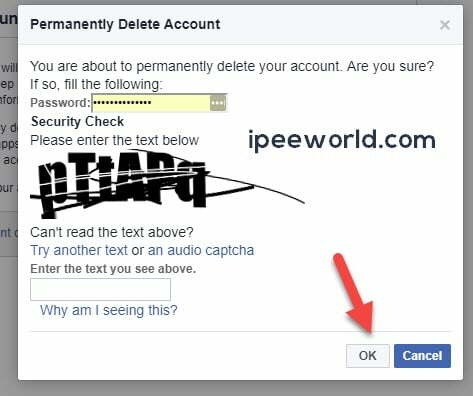 This method will tell us how to delete Facebook Account Permanently. Now, a popup will appear asking you to Enter the Password and write Captcha verification code. 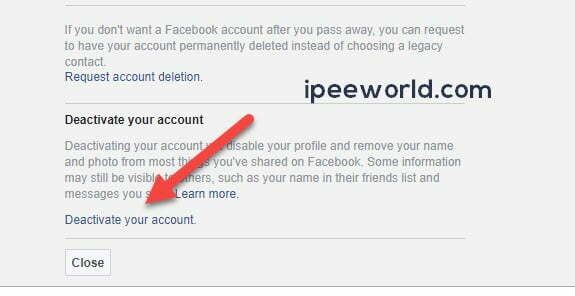 In this method we will see How to Deactivate Facebook Account temporarily for a short period of time. Voilaa! You have just deactivated your Facebook Account. Whenever you wanted to login back to your Facebook Account. Simply go to Facebook Login page enter your Username and Password, hit that Log In button and you will be instantly taken to your Facebook Profile. These are the methods to delete your Facebook account as well as Deactivate Facebook Account in under 1 Minute. Hope this article helps you to delete your Facebook Account Permanently. Everyone has a definite reason why they wanted deleted their account. No matter what your reason is, just follow the exact step by step guide mentioned above to get your Facebook Account Deleted.